Leftist and nationalist demonstrators speak to Arutz Sheva during heated protest over Operation Protective Edge. Heated protests between leftists and nationalists erupted in Tel Aviv late Thursday night, ahead of the IDF's expansion of Operation Protective Edge into a ground offensive. 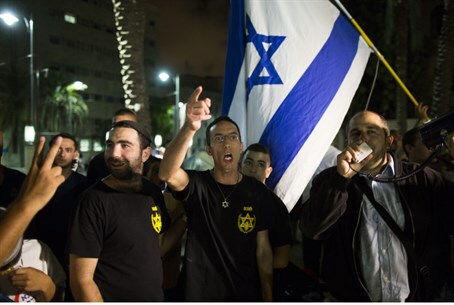 Arutz Sheva spoke to representatives of both camps at the demonstration, as the atmosphere in the Tel Aviv streets grew electric with political tension. Avner, an activist for infamous anti-IDF and anti-Israel group Breaking the Silence, claimed during the interview that Israel was "lying" in the contextual reasons behind the ground offensive, which was launched Thursday night after some 1,350 rockets were lobbed by Hamas terrorists at Israeli civilians and after Hamas rejected several cease-fire deals. Arutz Sheva also spoke to nationalist activist Baruch Marzel, who declared that the protest - much like the leftist "spontaneous protests" against alleged human rights violations in Israel's fight against illegal immigration - is being covertly funded by the international community, including the European Union.